You can preserve asparagus by pressure canning it at home. Canned asparagus has a softer texture than the freshly cooked vegetable does. But it is excellent in pureed asparagus soup or added to quiches or omelets. The advantage of canning asparagus rather than freezing asparagus (which preserves the texture better) is that you can store the sealed jars at room temperature. That means that if the power goes out, you needn't worry about whether or not your preserved asparagus is still good. It also saves room in your freezer. You will need to pressure can unpickled asparagus for food safety as it is a low-acid food. This creates a higher temperature needed to prevent the risk of botulism. For this process, you'll need quart-size canning jars, jar seal and rings, and a pressure canner. Your first step is to wash the asparagus. Next, hold a spear at either end and bend it. It will break at exactly the point where the stalk changes from tough to tender. The base end, without the scale-like leaves and pointed tip, is the tough part. You won't be canning that, but don't throw it out! Peeled, it is still an excellent vegetable and fine for making asparagus soup. Once you've snapped all of the asparagus spears and have a heap of the tender ends, trim as necessary so that none of them are longer than six inches. Lay a clean quart-size canning jar on its side. Slide in the asparagus spears with the wide base end towards the bottom of the jar. 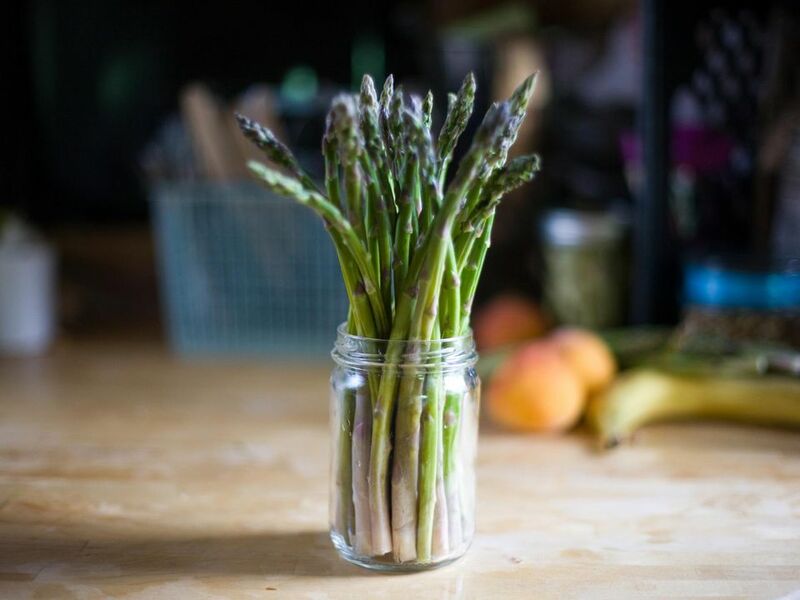 It is easier to get the spears to line up straight if you load the jar sideways like this, and that enables you to fit more asparagus into each jar. Keep adding spears until you can't squeeze even one more in. The spears will shrink slightly during processing, and packing them tightly ensures they won't float up out of the canning liquid. You can add one teaspoon salt to each quart jar. Note that the salt is not a preserving factor here, but it does improve the taste of the final product. Bring water to a boil. Pour the boiling water into the jars to cover the asparagus. The asparagus spears should be fully immersed in the water, but there needs to be at least one inch of space between the surface of the liquid and the rims of the jars. Place the seals and rings on the jars. It is essential that you pressure can the asparagus. You cannot can unpickled vegetables in a boiling water bath without risk of botulism. But with pressure canning, you are safe. Process the jars at 10 pounds pressure for 40 minutes (11 pounds with a dial gauge canner). If you want a shorter processing time, you can cut your asparagus spears shorter and pressure can them in pint instead of quart jars for just 30 minutes. Adjust the canning pressure if you live at a high altitude.